We just wanted to share with you our experience in using a speed bar with a SupAir harnesses. We fly with the speed bar fully pressed a lot of the time. The way the speed bar is attached has a direct influence on safety and comfort during flight. Our team flies SkyMax Paramotors. However the experience gained should be applicable to all Paramotor's with S horns and SupAir harnesses. 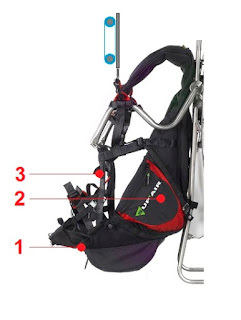 SupAir harness has three points of speed bar attachment. The pulleys are mounted in points 1 and 2 and it seems that most pilots do not know about point 3. 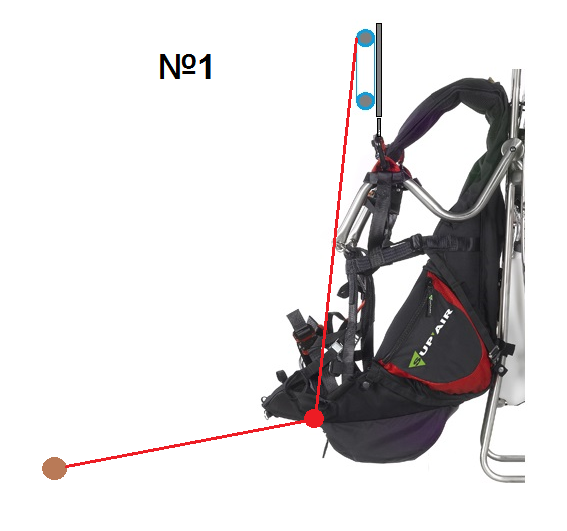 Point 1 – Pulley located at the bottom of the harness. 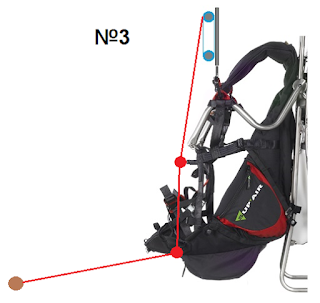 Point 3 – The strap for attaching the pulley is in the middle of the harness. We have three possible ways of attaching the speed bar. Every different way has its advantages and disadvantages. All the conclusions are based on flying cross country with the speed bar attached in the three ways described below. Speed bar attached using only the lower pulley (Point 1). it is really easy to press down the speed bar. When you press the speed bar the paramotor tends to lean backwards. It is hard to hold the speed bar out for long periods of time due to strain it causes on your legs. The speed bar lines come through the lower pulley (point N1) and the pulley located inside the harness (pulley N2). you can press the speed bar for longer periods of time without your legs tiring. The Paramotor tends not to lean backwards. Speed bar lines go between the harness and pilot’s fly suit and can be quite heavily compressed. - More effort needed when pressing the speed bar. - When you release the speed bar, the compressed lines between the pilot and harness could get stuck in position causing a delay. At this point it becomes dangerous. Speed bar lines goes through lower pulley (Point N1) and middle pulley (Point N3). To use this type of speed bar attachment you need an additional pulley. Mounting this pulley needs no sewing. 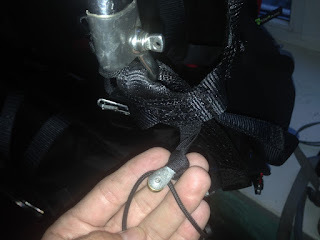 You put the strap through the pulley’s mounting point. Put the pulley through the strap again and tighten it up. You can see the result in the photo below. In my opinion this type of attachment of the speed bar works best for us. It is easier to press the speed bar. The paramotor is not leaning backwards too much. You can keep the speed bar pressed for a long period of time.